The need to always create. The need to always make something. This is my page where I show you all a sampling of my "crafting." I don't want to get into a debate about what a 'real' artist is, or what fine art is versus folk art. Everyone has their own opinion. I only went to art school for one semester and I found that "fine" art is full of stuck up people who use the excuse of being an 'artist' to act like an idiot. (I'll never forget when someone smeared sh++ on the wall in art class @ SFAI.) Don't get me wrong, I like 'alternative.' I grew up in a hippie home and my dad was always talking about the counter-culture. I have met many famous people and not-so-famous from the counter-culture. But even these people are looked down upon by the world of fine art. New York fine art is not real. Painting a canvas one color and selling it for big bucks in not true art. It is a way of manipulating people with money into believing that they are investing in something that is truly fine and extraordinary. Rather sad that art dealers are the ones who decide what is fine art and what deserves to be put up as special. So, Do I think folk art, and the crafts that are traditional in other countries and have been relegated to (mostly) women here is art? YES! After all I am an anthropology major. To me the ability to knit, crotchet or weave a fine piece of material, and add the artistic adornments are just as important as paining. Paintings and especially carvings last longer. But to learn about cultures from different parts of the world one, needs to also look at the clothing. For example look at the AMAZING embroidery work on the clothing of the Guatemalan Indians (modern Mayan). Imagine how amazing the Mayans dressed before the Spanish arrived. Just imagine what the material culture was like! We only have the pyramids and carvings left, and few other things. Anyway I am rambling. To me knitting et. al. is a way of being creative. It is an art form. I am not a very good "artist" in many ways. In knitting, quilting etc. I am far less skilled than most. But a hand made sweater or scarf means so much more than one bought from a store and made by a machine. To me it reminds me of how humans have been clothing themselves prior to the industrial revolution. They are important skills that should be appreciated. And they are fine to me. So even though some anthropologist and historians debate the beginning of 'art' only by painting I believe 'art' first began when people started to adorn themselves: piercing, tattoos, jewelry, hair styles, clothing, etc. Ahh so many necklaces have I made. Here's a page that shows some of the many necklaces I have made. I did not make any of the beads so I guess one can say I designed the necklaces. . 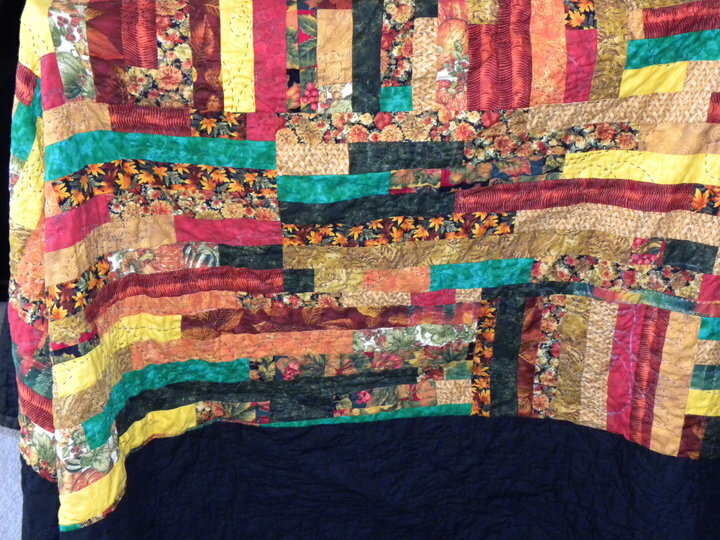 Some of my Quilts. The pictures aren't very good and don't do the blankets justice. 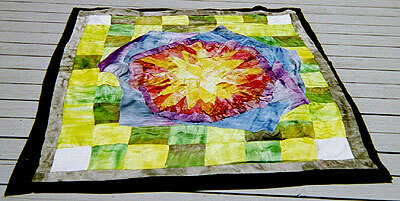 Batik Fabric sewn together to make a blanket (both sides are this fabric) with double batting inside. 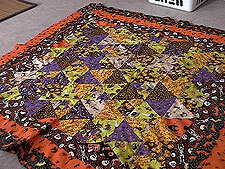 The quilting part is me "quilting" different color yarn around the butterflies. All the rainbow colors. 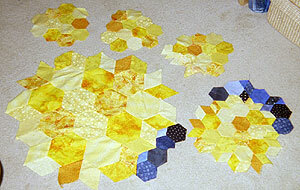 I quilt a certain number of butterflies for each color depending on the size of the panel. For example I will quilt for 4 or 5 butterflies on one side of a panel then 4 or 5 butterflies on the other side using red thread that is normally used for stitching. 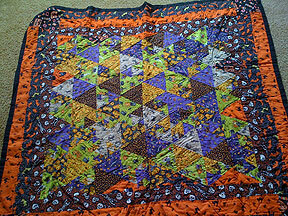 So sometimes the butterflies overlap and sometimes the butterflies don't and tone the other side here is no batik butterfly just a stitched one. Overall I think it looks really neat. 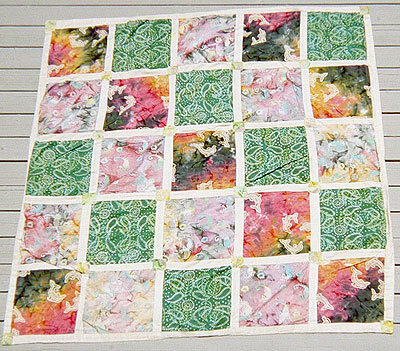 Batik fabric sewn together in squares. 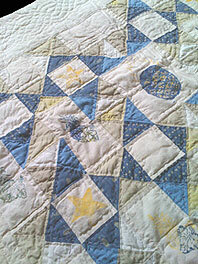 The quilting was rather simple and done with a machine on corners of quilt. 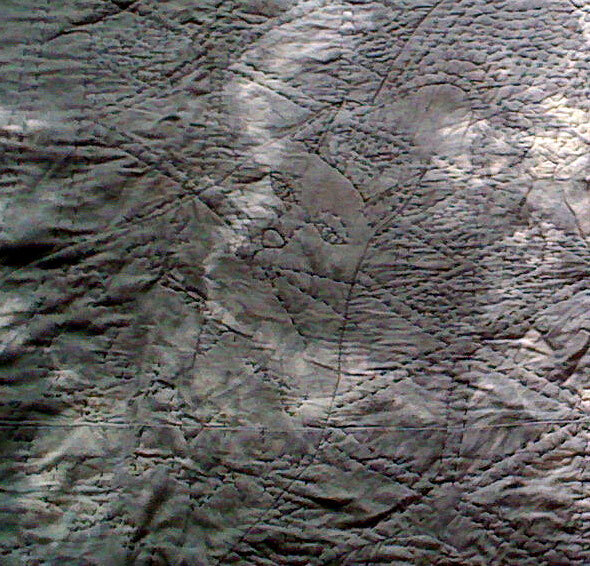 Big X's or, if fabric was the fish I quilted around each fish using thick white thread. My second quilt ever. 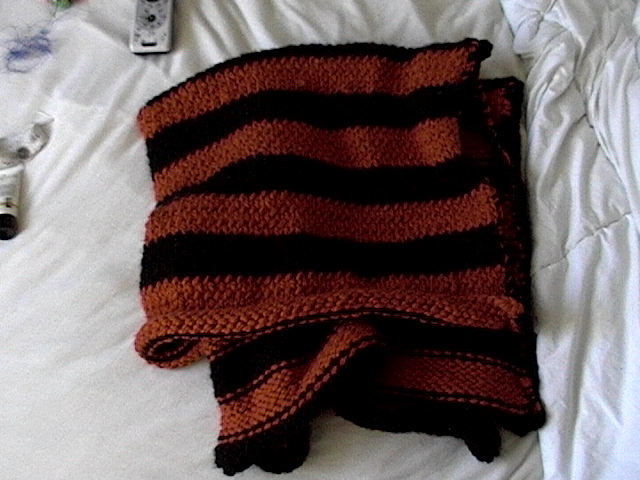 I only used one layer of batting and it was 100% cotton so it is a rather thin blanket. The white fabric is actually tan-ish natural cotton (can't remember the official term) and is used for the back of the quilt too..
My first quilt ever. 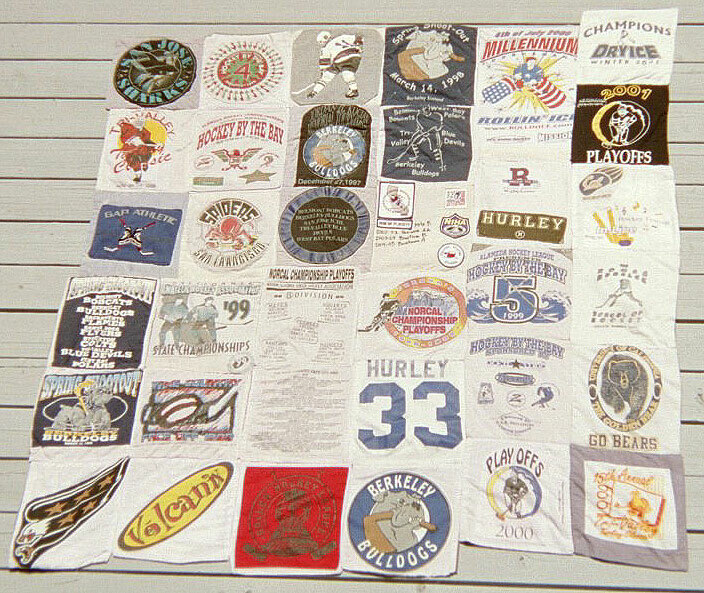 This is a great idea for parents who don't know what to do with all those T-shirts your child gets for a particular sport. In this case the sport is hockey. This is an ongoing blanket and has grown over the years. The secret is to turn each T-shirt (one side or both depending on image) into a square (mine end up being rectangles most of the time). 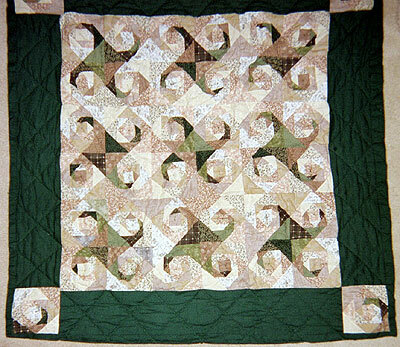 Each square is quilted, batted and sewn separately. When you get enough squared to make a side you add it to the blanket. I also added patches and hockey related T-shirt images that didn't come from a tournament or playoffs. I did not use a pattern but came up with my own design. It is a Sun & Stars theme. 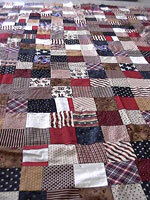 It is 90% hand sewn and hand quilted. The blanket ended up being rather large after I had sewed all the pieces together. 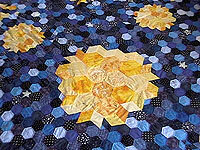 I did use the sewing machine to put the back of the quilt to the front plus a little bit with the octagons. I found that I could not line things up evenly with the sewing machine and that those parts that I attempted using a machine were 'off." So, back to hand sewing. 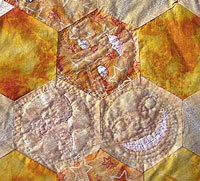 Besides regular 'quilting' I' quilted' various sun and moon faces on the larger yellow blocks. My third quilt. I didn't know about proper sizing for the triangles so the middle has a lot of extra fabric. If I could do this over it would look a lot 'cleaner.' Except for the fact that my cat has dug her nails into the silk so much that it is beginning to run. Don't use silk if you intend to actually use the blanket, or if you have cats. 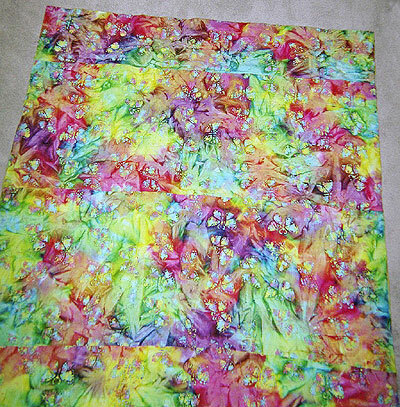 I got scrap silk at Dharma Trading company and died the silk various colors. The died silk looks very cool. I then cut the middle shapes out and sort of winged it from there. It looks very nice in real life but for the sizing. It was a learning experience and I now understand the importance of correct shaping. 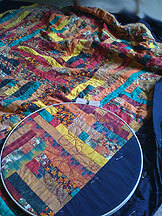 I doubled the batting for this quilt as I learned after my batik quilt that some batting is just too thin. The back of this quilt is black cotton. My first 'baby' quilt, and the first quilt I have made for someone else. Very simple squares placed randomly. The cloth I got from Beverly's in a pack plus I added some off-white. The back is flannel. 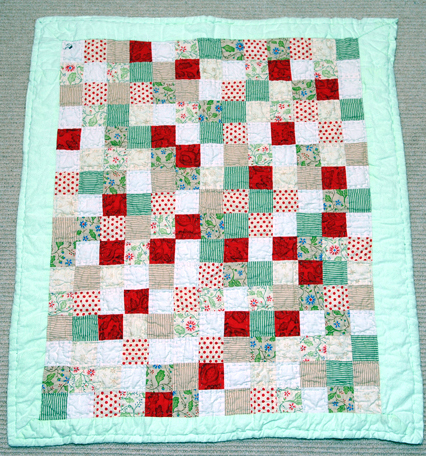 Very easy quilt but I still managed to end up with things out of alignment, even using the sewing machine. So a few "rows" are off by a lot. It seems to me far easier to line things up when I sew by hand. I tie-dyed the cloth for the back of this quilt red. I LOVE tie-dye and it looks very cool but, when I washed the blanket, things turned a shade of pink. It's a pinkish flag blanket. 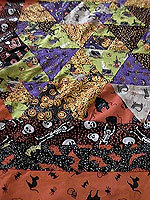 I love to go to Beverly's or Joanne's and buy the scrap fabric. And sometimes they have a 'set'of fabric on sale that just looks too good to pass up. 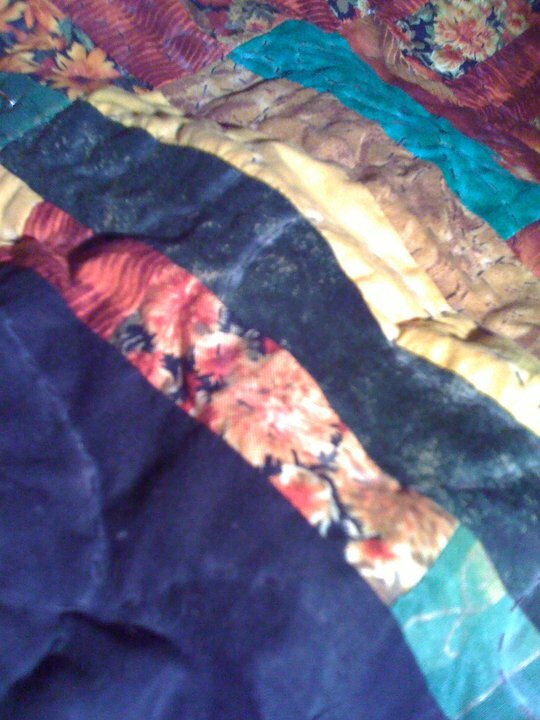 This quilt resulted from one of those fabric packs. 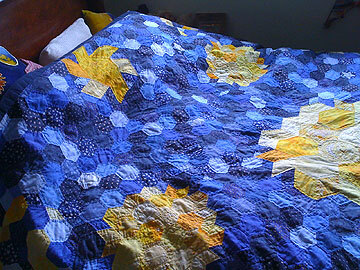 This is the last quilt I finished. It took about two years because I worked on it off and on. It has a fall theme. 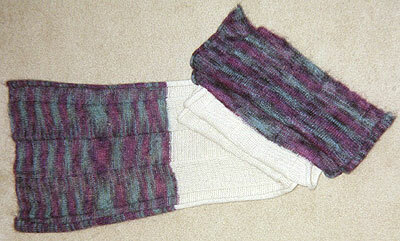 Here is some of my knitting. I have knitted two blankets but I don't have pictures of both. The fist piece I ever completed was one of my two blankets. Back then I didn't know about counting stitches, or the tendency to absentmindedly add stitches, as a begginer, so my blanket is wider at one end than the other. Very Good Idea! for those who have a lot of knitting 'stuff.' They sell these types of bags but they are rather expensive. I made pockets for the needles and labeled them with tin tags a,b,c,etc. that were actually made for scrapbooking. Below the knitting pocket is one long pocket and on that pocket is a smaller pocket (the batik fabric). 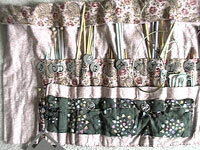 I sewed and glued pink Velcro to the inside of each pocket as well as at the top of the bag (where you see the fold in the pictures) . The Velcro at the top holds the longer knitting needles in place. I roll up the bag and use a hair rubber band to keep it rolled up. 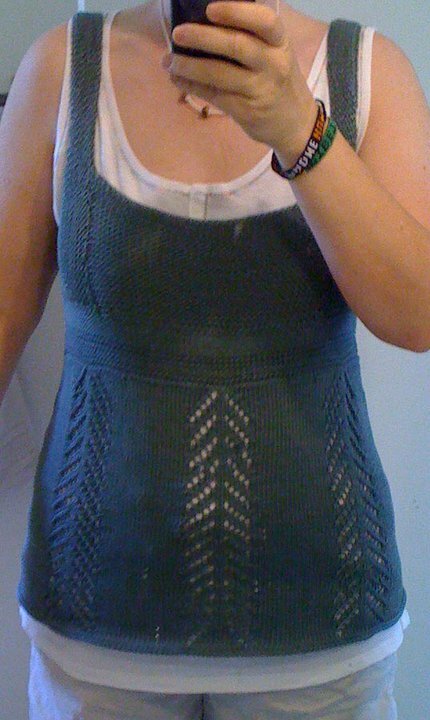 I came up with this before I saw the same basic idea on Knitty Gritty. Purl 10, knit 10, purl 10, knit 10, purl 10. White two balls of yarn. Colored two balls of yarn, one on each end. I made the middle first with a mohair type white yarn. The shape is wide enough for a shawl or long enough for a scarf so I bought two balls of yarn at $17 each ( mohair alpaca something) and added both ends. 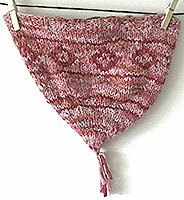 I used larger needles on rather thin yarn so the scarf has a lacy look about it. then after 7 or 8 rows I begin the braid in the middle. next row reverse: knit 14, purl 6, knit 14, purl 6 knit 14, etc. after 5 rows of this I switch three using separate needles to create the braid. I can't explain how to do it very well, so look in a book, or go here. 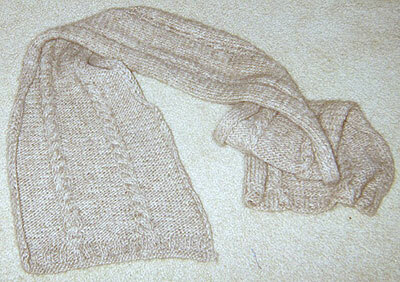 I used four balls of wool for this scarf. Not very long for the amount of yarn . I used two balls of yarn divided again because the yarn was similar but not exact. I had originally bought one ball of yarn for my son to teach him how to knit. He wasn't into it and the yarn sat around for a year or two. I started knitting this scarf and found one ball wasn't enough so I bought another. Same brand but the colors had changed some. So I divided each ball into two and knitted in 4 parts, old ball, new ball, old ball, new ball. EXCEPT for the width ends. The very last stitch at each end has to be the opposite of what you are on. 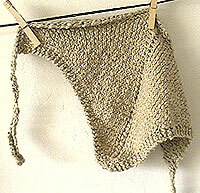 So if you just knitted 7 the last stitch is a purl. Then you are on the next row and you knit the first stitch and purl the next 7. This keeps the scarf from curling (at least with this acrylic yarn). I made it with random stripe thicknesses to give the hat a zanier look. repeat for as long as you want adding on different colors. I measured the length of each color by putting it next to the last similar color, I did not count rows since it really didn't matter as the yarn is so fuzzy you wouldn't be able to tell that some colors are longer or shorter by a row or two. 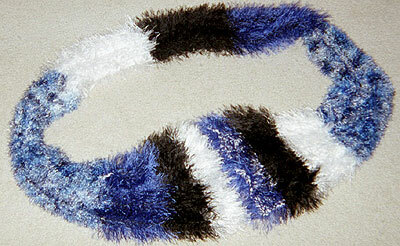 It is a scarf although the picture makes it look like a circle. The ends are in the front and are just placed next to each other for the photograph. The ends are the three colors on each side, one side dark blue, black, white, other side white, black, dark blue. 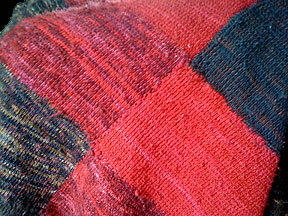 Detail of 1st scarf where I randomly knitted or pearled to make a 'crazy' scarf. 100% Organic Non-bleached cotton from Dharma. 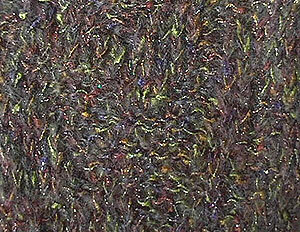 Inca Cotton, "Spun in Peru"
Who would of thought it would be green? then I changed it a little. Not sure how to explain this but I knitted a "hair doily" like the ones my American Sikh friends wear in their hair. They bought their's from who knows where, but I found that you can knit them by following certain hat patterns, and using sock yarn and size 1, 2 or even 3 kneedles. 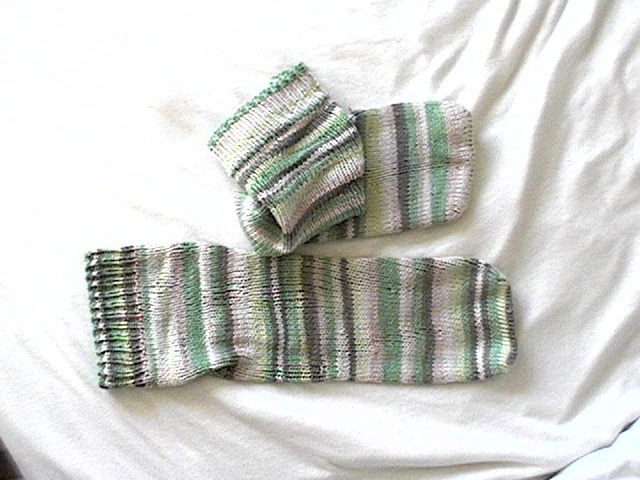 My first pair of socks. 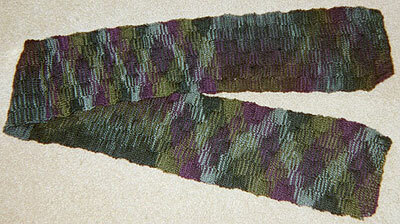 I knitted them completely once, found them way too big and took one apart and began knitting it again (above). But this one still looked bad, lots of mistakes and still too big so I did them over again. I got this pattern from the internet and didn't understand the heal part at all. I kind of made up my own heal but I am sure it is what you are supposed to do. Took me forever to find out what a "dropped stitch" is as none of my knitting books explained it very well nor the internet. It really helps to understand what one is because it allows you to do so much more than knit simple squares! 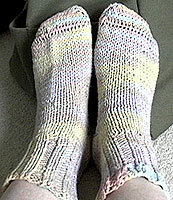 My first pair of knitted socks finally finished! Just a tube really, no heel. 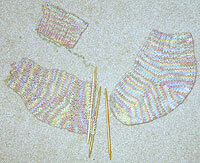 I have knitted tons of socks since the first shown above. Found there are several ways to make a heel! 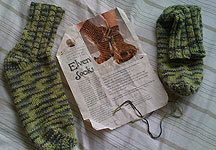 But I love the pattern for "Elven Socks" found in Faerie Magazine. The front of a sweater I made recently. I used a pattern. Will add the back part soon as that is the best part of the sweater. A bit of painting on fabric a bit of needlepoint and simple sewing. 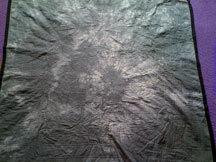 First I ironed on the images on the back of the fabric, then I used silk paint to paint the front of the fabric. It ran a bit because the fabric is a type of velvet. 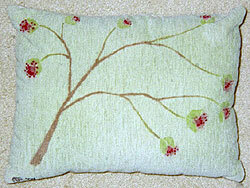 Then I stitched around the images using rather thick needlepoint yarn. This pattern is similar to one I saw in an Arts & Crafts magazine ( Bungalow). 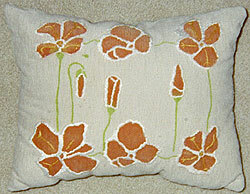 My silk paint ran a bit so I stitched white around the flowers. Otherwise the flowers would be a big orange mess. Material is for furniture kind of velvety with a rubber backing. I made this design up. Painted a branch with little flowers. I stitched little 'dots' on the flowers. The red silk paint ran a little so the dots are a bit abstract. Material is for furniture kind of velvety with a rubber backing. 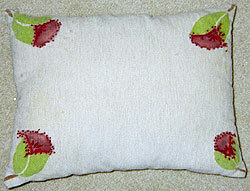 The back of the pillow to the left. Made up the pattern again. I was trying to go for an Arts & Crafts style. The red silk paint ran again thus the stitching with red needlepoint yarn. There are zillion of knitting and crafting links out there. I will put down some, hopefully they are the useful ones. 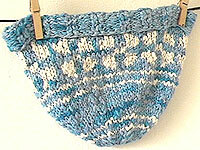 Lots of knitters have BLOG websites with good pictures/patterns. Go to google and type in knitting blogs. Definitions of Sewing Terms - from a LOTR clothing website but good info. Harry Potter Scarves - one of several websites that have patterns for the HP scarves from the movies. Historical Clothing - A bibliography of sources for the design and construction of clothing throughout history. Knitty.com - very nice magazine with really neat designs/ patterns. I LOVE this site! Knittinghelp.com- helpful website for knitters. Has interesting stuff and videos to go along with some of the patterns. 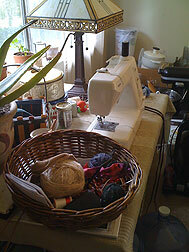 Knitty Gritty - TV show on DIY. It seems it's been cancelled because they did not renew the domain name. Has videos to watch, however. 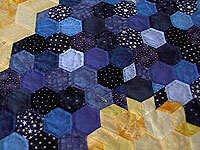 The Online Quilt Block Pattern List - List of Quilt block names arranged alphbetically . Understanding Fabric - a good basic introduction. 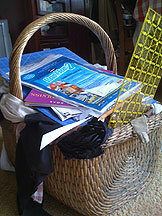 Includes info on yarns, woven fabrics, theirsbrics, felt, etc. Has other good info too..